The bioluminescent enzyme firefly luciferase (Luc) or variants of green fluorescent protein (GFP) in transformed cells can be effectively used to reveal molecular and cellular features of neoplasia in vivo. Tumor cell growth and regression in response to various therapies can be evaluated by using bioluminescent imaging. In bioluminescent imaging, light propagates in highly scattering tissue, and the diffusion approximation is sufficiently accurate to predict the imaging signal around the biological tissue. 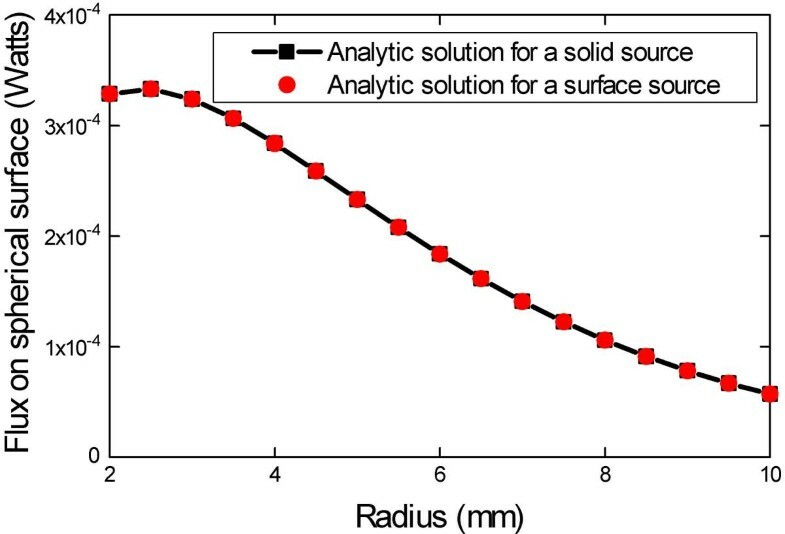 The numerical solutions to the diffusion equation take large amounts of computational time, and the studies for its analytic solutions have attracted more attention in biomedical engineering applications. Biological tissue is a turbid medium that both scatters and absorbs photons. An accurate model for the propagation of photons through tissue can be adopted from transport theory, and its diffusion approximation is applied to predict the imaging signal around the biological tissue. The solution to the diffusion equation is formulated by the convolution between its Green's function and source term. The formulation of photon diffusion from spherical bioluminescent sources in an infinite homogeneous medium can be obtained to accelerate the forward simulation of bioluminescent phenomena. The closed form solutions have been derived for the time-dependent diffusion equation and the steady-state diffusion equation with solid and hollow spherical sources in a homogeneous medium, respectively. Meanwhile, the relationship between solutions with a solid sphere source and ones with a surface sphere source is obtained. We have formulated solutions for the diffusion equation with solid and hollow spherical sources in an infinite homogeneous medium. These solutions have been verified by Monte Carlo simulation for use in biomedical optical imaging studies. The closed form solution is highly accurate and more computationally efficient in biomedical engineering applications. By using our analytic solutions for spherical sources, we can better predict bioluminescent signals and better understand both the potential for, and the limitations of, bioluminescent tomography in an idealized case. The formulas are particularly valuable for furthering the development of bioluminescent tomography. Light propagation in scattering media has attracted attention in many areas of physics, biology, medicine, and engineering. This process can be described by the radiative transfer equation , which is a complex integrodifferential equation. Under strong scattering conditions, the radiative transfer equation can be reduced to the diffusion equation, but this still does not permit exact solutions in most cases. Recently, various approximate methods for the radiative transfer equation have been presented [2–5]. Arridge et al. presented a method for handling nonscattering regions within diffusing domains. 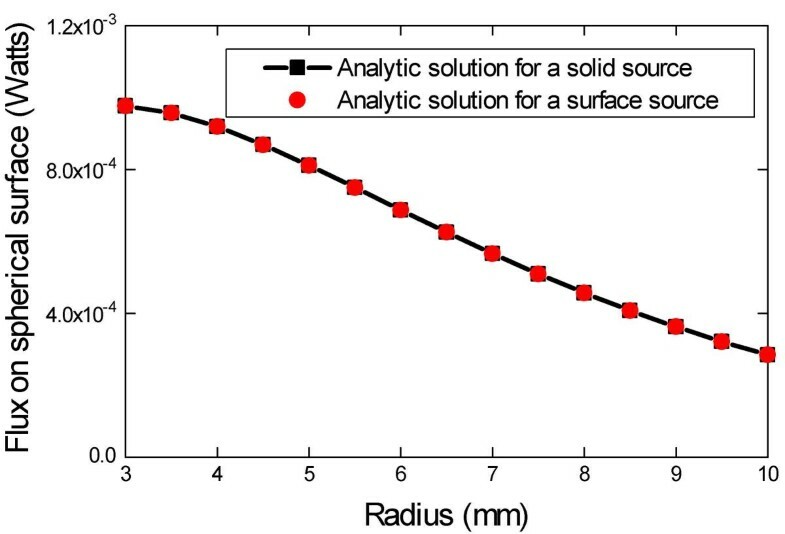 The method develops from an iterative radiosity-diffusion approach that uses a finite element method. The fundamental idea is to introduce extra equations into the standard diffusion finite element method to represent nondiffusive light propagation across a nonscattering region. Aydin et al. introduced a two-dimensional, finite element spherical harmonics radiation transport method for the simulation of light propagation in tissue. They derived a photon-transport forward model in turbid media that treats weak inhomogeneities through a Born approximation of the Boltzmann radiative transfer equation. This model more conveniently replaces the commonly used diffusion approximation in optical tomography . Analytic solutions to the diffusion equation in some simplified cases have been explored previously [5–7]. Boas et al. presented a spherical harmonic solution in the case of spherical inhomogeneity in an infinite medium. In this instance, a closed-form infinite series solution was obtained. Additionally, they compared their calculations to experimental results involving a perfect absorber in a large diffuse region. They observed good agreement between the experimental and the analytical data. Walker et al. extended the above spherical results to cylindrical inhomogeneity. Fishkin et al. derived analytical expressions based on the diffusion approximation that describe the photon density in a uniform, infinite, strongly scattering medium that contains a sinusoidally intensity-modulated point source of light. They also reported good agreement between their analytical and experimental results. However, these solutions to the diffusion equation were derived for a point source only. Recently, light propagation in scattering media has attracted increased attention in biomedical applications , especially in bioluminescent imaging as applied in bioluminescent tomography. The bioluminescent enzyme firefly luciferase (Luc) or variants of green fluorescent protein (GFP) in transformed cells can be effectively used to reveal molecular and cellular features of neoplasia in vivo. Tumor cell growth and regression in response to various therapies can be evaluated by using bioluminescent imaging. With a number of key collaborators, we are developing a bioluminescent tomography system for the 3D reconstruction of a bioluminescent source distribution in a living animal marked by bioluminescent reporter luciferases from diffuse signals detected on a spherical surface containing the animal. In bioluminescent experiments, the density of the bioluminescent signals decay exponentially with time. Actually, bioluminescent imaging is a time-dependent problem. In this paper, we formulate solutions to the time-dependent diffusion equation and the steady-state diffusion equation with solid and hollow spherical sources, respectively, in an infinite homogeneous medium. These formulas are then verified in a Monte Carlo simulation performed using a commercial software package, TracePro. The solution to the diffusion model in a homogeneous medium can be used to achieve reasonably good qualitative estimates of the signal level and can be applied to estimate rapidly the positions of light sources for bioluminescent imaging. The closed form solution is highly accurate and more computationally efficient in biomedical engineering applications. Both the fluence and the flux are in units of W m-2. The transport equation can be regarded as a conservation equation for the radiance; it neglects coherence and polarization effects. In the following section, we analytically solve for the photon diffusion with spherical sources embedded in an infinite homogeneous medium. where p is the source power; R is the radius of the spherical source; and ω is the decay coefficient of the source power related to time. where p is the source power; R is the radius of the spherical source; ω is the decay coefficient of the source power related to time; and β is the exponential decay coefficient related to the radius of the spherical source. where p is the source power; R is the radius of the spherical source; and μeff denotes the effective attenuation coefficient defined as μeff = (μa /D)1/2 = [3 μa (μa + μs (1 - g))]1/2. To verify the correctness of the above analytic results, two sets of computer simulation experiments were performed using the well-known MatLab and a commercial software package, TracePro (Lambda Research Corp., Littleton, MA, USA; http://www.lambdares.com/products/tracepro/index.phtml). The first set of tests examined the relationship between the solutions for spherical surface and solid sources. The other set of tests demonstrated good agreement between the analytically computed and the Monte Carlo simulated data. The numerical tests were conducted with various parameters using solutions for spherical surface and solid sources. In the first experimental setting, a spherical solid source of radius 1 mm with power 0.0002513 (W) was embedded in an infinite homogeneous medium. The medium was defined by μs = 40.3 mm-1, μa = 0.15 mm-1, n = 1, and g = 0.994. In the second setting, a spherical solid source of radius 0.3 mm with power 0.0002513 (W) was assumed, with a medium of μs = 10.27 mm-1, μa = 0.082 mm-1, n = 1.37, and g = 0.96. Figs. 1 and 2 present some typical analytically calculated outcomes. These results indicate that the directly computed data using the solution formula for a spherical solid source are in an excellent agreement with their counterparts indirectly computed using the solution for a spherical surface source. In other words, the two solutions are consistent. Comparison of flux computed on a spherical surface in the first experimental setting according to the solutions for spherical surface and solid sources, respectively. Comparison of flux computed on a spherical surface computed in the second experimental setting according to the solutions for spherical surface and solid sources, respectively. In the following two numerical experimental settings, the optical parameters of the medium were set at μs = 23 mm-1, μa = 0.35 mm-1, n = 1, and g = 0.94, the same as the optical parameters of a mouse lung. The source, a sphere with a radius of 1.3 mm and power 0.00025 (W), was embedded in an infinite homogeneous medium. 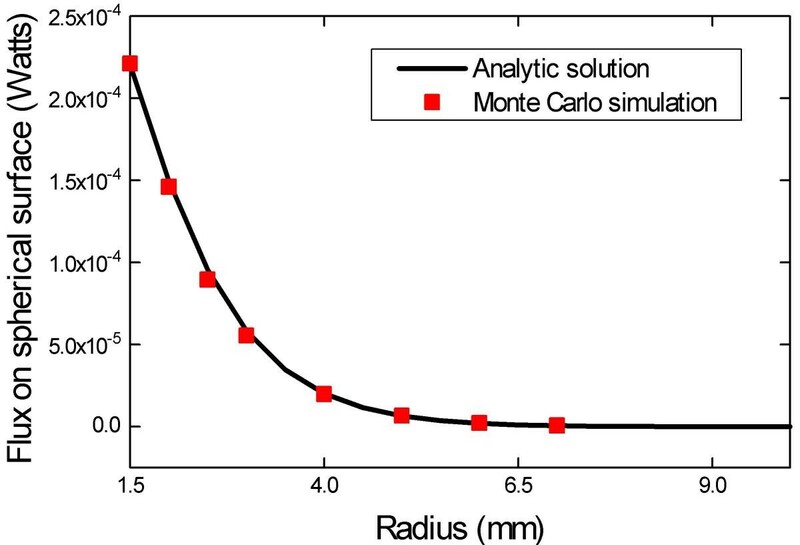 The power incidence on the spherical surfaces with different radii was computed by using the solution formulas and the Monte Carlo method as implemented in TracePro, respectively. Comparison of the two is shown in Fig. 3. In the other numerical experiment, the optical parameters of the medium were μs = 16 mm-1, μa = 0.20 mm-1, n = 1.37, and g = 0.85, the same as the optical parameters of a mouse heart. The source is a sphere of radius 1 mm with power 0.00025 (W). Fig. 4 presents a comparison of the analytic results and the simulated data from TracePro. It can be observed that there is good agreement between the computed and the simulated data. Comparison of flux computed on a spherical surface in the first experimental setting based on the analytic solution and the Monte Carlo simulation, respectively. Comparison of flux computed on a spherical surface in the second experimental setting based on the analytic solution and the Monte Carlo simulation, respectively. The primary utility of our analytic solutions is to accelerate the forward simulation of bioluminescent phenomena which will facilitate studies on bioluminescent tomography. The spherical sources we assumed are the most fundamental building blocks of the physical phantoms used in the evaluation of image quality. By using our analytic solutions for spherical sources, we can better predict bioluminescent signals and better understand both the potential for, and the limitations of, bioluminescent tomography in an idealized case. In conclusion, we have formulated solutions for the diffusion equation with solid and hollow spherical sources in an infinite homogeneous medium. 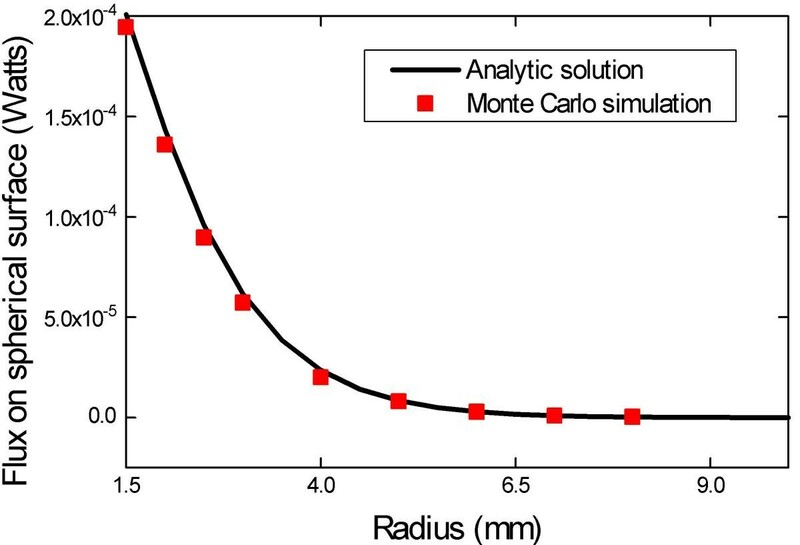 These solutions have been verified by Monte Carlo simulation for use in biomedical optical imaging studies. The formulas are particularly valuable for furthering the development of bioluminescent tomography. This work was supported in part by the NIH grant R21/R33 EB001685.